1A & 5A Programmable Rated Current. Draw out enclosure have modular design with CT shorting. Modular design with self CT shorting. SCADA Communication (Local & Remote). CSEPRO series offers a multi functional comprehensive smart protection solution for Feeder, Generator, Motor & Transformer segment. 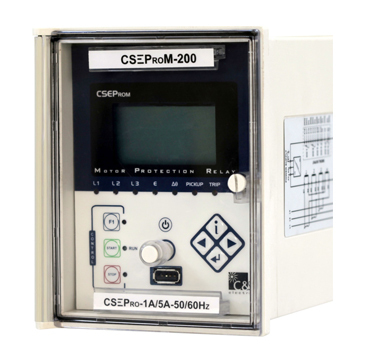 CSEPRO family of protective relays are advance numerical relays that provide multi protection and monitoring with reliable and fast protection solutions in a single unit.In this family of CSEPRO series, the CSEPROMxxx is an advanced motor protection solution which has fast, sensitive and secure protection for LV & MV motors, which are either operated via power contactors or power circuit breakers. CSEPROMxxx also provides an automation solution of power control. It complies with lEC60870-5»103, lEC61850, Modbus protocol for high integration of protection & control. The CSEPRO-M relay is the ideal answer to problems requiring more versatile or accurate protection for a motor than can be offered by standard thermal overload relay. It employs the latest micro controller techniques to provide the complete solution for the protection of medium & large sized and three phase motors with high inertia load in all type of ordinary contactors controlled or circuit breaker controlled motor drives. It handles fault condition during motor start up, normal run, idling and cooling down at standstill in, for example pump, fan, mill, crusher applications. Intelligent key for DI status & DO status, details of fault pickup & status of last fault occurred. Last 10 fault record (non-volatile memory) with time stamp. Last 100 event record (non-volatile memory) with time stamp. CSEPRO-F relays are equipped with self supervision function. Star 8. Delta configuration 63.5/110V.